Here you are in Cegep. You'll probably be in university in a little more than a year. I'm sorry, but I feel forced to give you some advice to succeed in your studies. I'll try to be brief (and entertaining, as far as possible!). Can you see the horrible poster at the top of this text? 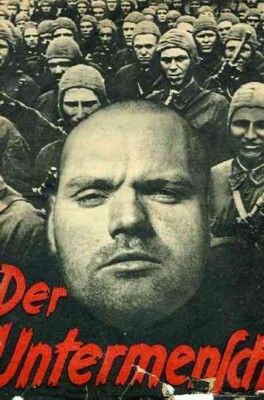 Nazis despised others by treating them like "sub-men" ("untermensch" in German). Unfortunately, the Quebec Department of Education divides university students between "supermen" and "subhumans". The supermen are all those who studied pure sciences in cegep (Mathematics, Physics, Chemistry, Biology), and the others are considered like untermenschen. - Of course, I don't agree with the Government! All students have the same human dignity. - You'll always be able to find some dumb people who studied "hard" sciences, and smart people who didn't. - I don't claim everybody should become a mathematician or a physicist! - If you select a thousand students randomly, and that you make 500 of them take bad "hard" science courses given by bad teachers, and that the other cohort of 500 students is given good courses by good teachers, but in History, Poetry, Philosophy, etc., the "hard" science cohort will end up intellectually under-developed! To make things worse, it's not as if you got "half a general culture" by obtaining a cegep degree in pure sciences, and "the other half" if you obtained another kind of cegep degree. What actually happens is you have the choice between half a general culture (pure sciences) that you can complete by reading good books by yourself, or the post-modernist crap you'll get in university if you avoid pure sciences in cegep. 3.2) Establishment of ghettos in university and on the job market. The "untermenschen" are the university pariahs. They are held prisoner in a few faculties and a few programmes (like Sociology, Philosophy, Journalism, etc.). Once they get to the job market, they often have more problems finding a job. If we consider how much our economy depends increasingly on high-technology, it's literally an economic theft that is done to our Nation, when we let students avoid pure sciences. 3.3) Students must choose their career earlier. A few years ago, people who obtained their pre-university degree were all treated the same; as soon as they set foot inside a university, all the doors of all the faculties and departments opened wide for them. They had acquired the general culture that let them adapt themselves to any field of knowledge. Moreover, if a student realized he wasn't headed in the right direction, he could easily change his field of study. These days, a teenage minor must decide on his career very early, without having even had "a serious taste" of all the fields of learning. And his choices are difficult to change (unless he does his pure sciences in cegep). 3.4) Acquired distaste isn't the same thing as mental capacities. Young persons who avoid pure sciences in cegep often say "I don't like it", or "I can't do math", and "anyway I'll never need that stuff". I feel like saying that if they had had good teachers and good textbooks in high school, they would have acquired the taste for Mathematics and other sciences. And when we enjoy something, we often discover unexpected capacities! And when we've developed a new capacity, we're happy, and on top of that we often discover applications for our new capacity! There is no reason why a student, who's finishing his pre-university schooling, should have avoided the mathematical, physical, chemical and biological sciences. The Government should change the curriculum to establish a truly general culture. As long as this is not done, I advise you, dear Olivier, to do your pure sciences in cegep, and to compensate for this half-culture with your personal reading efforts in Literature, Poetry, History, etc. A few years ago, the Education Department was called the "Public Schooling Department ("Ministère de l'instruction publique" in French). Certainly not because the people in that department underestimated education, or that they thought university could never make a contribution to the education of young persons! No, it was because they were acutely aware of the fundamental difference between schooling, i.e. assimilation of knowledge and skills, and education, which includes the moral virtues. In a way, when you stepped out of kindergarten and arrived in first grade, your education was almost finished. The education given to young children by their parents is invaluable, and if it's not well done, it's almost impossible to fix. Our jails are filled with proofs that the first education given by parents is essential to our society's health. Of course, you don't need to change the Department's name to succeed in school, but it's good to keep in mind that in this context, the word "education" is partly a consequence of verbal inflation. The Government has a vested interest in looking good, in order to get re-elected. That's why some portions of Quebec's universities tend to be transformed into human parking lots to decrease unemployment statistics. Independently of the value of this "job creation" approach, be careful not to end up in one of those parkings. Of course, it's not always that obvious! There aren't any white lines and parking meters in the classrooms! The best way to avoid this trap is to do your pure sciences in cegep (see #3 here above), even if you have no intention of becoming a mathematician or an engineer, etc. Be also wary if few efforts are required of you, in certain programs. If you don't need to work hard to get good grades, it's not necessarily because you're a genius! It might be because you're not clever enough to figure out you've been "parked" elsewhere than in a classroom! Finally, beware of the surprizing ease with which university diplomas are handed out left and right. Politicians often compare their graduation rates, a bit like baseball players compare their hitting averages. Equality of all men is a very good thing, but the exaggerated egalitarianism is just a lie. All men have equal human dignity, but their talents (and especially their work ethics!) can be very unequal. I don't know what your parents tell you, concerning your career, but I know several teenagers who were told by their parents: "Do what you like, that's what's most important!" This is partially true. Yes, taste is a good indicator of our capacities, but taste can be developed, and it can even be twisted! Unfortunately, we can accustom ourselves to just about anything, and once accustomed, we will enjoy it. This is one of the reasons why Aristotle once said that education consists in finding pleasure where we should find it! The other warning concerning this ditty about "doing what you like", is that it's not the only thing to consider. You certainly remember that a geometric straight line is composed of an infinity of points. Well, Aristotle apparently once said that our job was at the intersection of two straight lines: the straight line of all the things we like doing, and the other straight line composed of society's needs. Don't forget the existence that second straight line, and don't forget that the first straight line can have an infinity of points! This is very important. Not just to go to Heaven, but even to have successful studies! Indeed, our reason is not disconnected from our will. It's a bit as if your will was the lens of your intellectual camera. If the lens is dirty (perverted by vices), you'll never be able to take good pictures of science with your reason. I'd also recommend to you an excellent book on "how to be a good student": The Intellectual Life by Sertillanges (English translations are commonly available). That being said, I will pray that God grant you the courage to successfully complete your studies, so you may be able to serve Society and the Church!